By 1915, loggers had stripped away almost all of Mount Mitchell’s virgin forests, prompting alarm among area residents and state officials. In response, the state purchased 2,000 acres at the mountain’s peak and in 1916 declared it not only North Carolina’s first state park, but the first state park in the entire Southeast. A century later, the East’s highest mountain remains a safe and sound jewel in a park system that has grown to 35 state parks, 20 state natural areas, five state trails, four state recreation areas, four state rivers, and seven state lakes. Western North Carolina’s 22 units of the system include 9 parks, three state trails, three state rivers, and seven natural areas, only one with public facilities. Statewide, the parks have much to celebrate on this centennial: In fact, they’ve never been more popular. Attendance has increased to unprecedented levels since the start of the Great Recession, from 14.9 million in 2009 to 17.3 million in 2015. 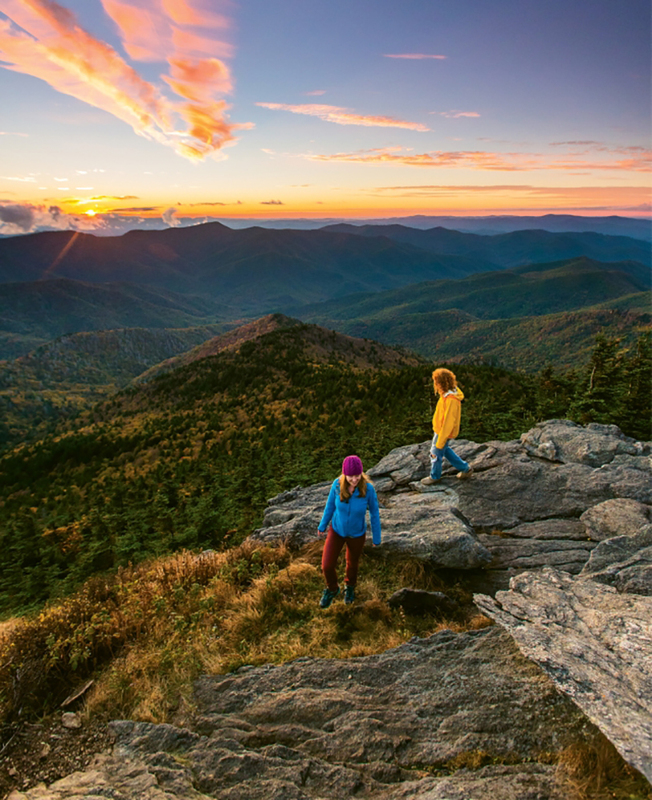 Here’s a tour and a users’ guide for WNC’s state parks, in all their beauty and variety. Mount Mitchell’s summit road takes visitors to a spiraling observation tower that stands nearly 6,700 feet above sea level. Don’t stop there, though: Hike the Balsam Nature Trail, passing signs explaining the fragrant Canadian Zone forest. Or leave the picnic area at the other end of the parking lot for an intensely scenic, two-mile round-trip hike through verdant evergreens to Mount Craig, the East’s second highest peak. Why go: Bragging rights: You can buy an authentic summit elevation benchmark medal in the gift shop, or pitch a tent in the East’s highest developed campground. Best time to go: In good weather—call or check the park’s website for closures and warnings. The park entrance is on the Blue Ridge Parkway and often closed in winter due to ice and snow. Mount Jefferson towers over Ashe County, while the park’s mountain-climbing motor road whisks visitors to distant views. Be sure to stop at Sunset and Jefferson overlooks. At the top, a worthwhile 1.1-mile hike across the crest on the Rhododendron Trail starts at a picnic area in a breezy deciduous forest. Or, head out to Luther Rock and peer down on the town of Jefferson with its early 1900s courthouse. Add a loop of the newish Lost Province Trail for a 2.2-mile hike. It’s said that caves near the summit sheltered escaped slaves as part of the Underground Railroad. Why go: If you don’t have time to hike, auto access to summit overlooks makes distant views a quick add-on for drive-by sightseers. At nearly 3,000 feet, the South Mountains are the loftiest peaks east of the Blue Ridge, a plus for the state’s urbanites and foothills dwellers who want a hike in the mountains without driving hours west. Early roads built by the Civilian Conservation Corps today serve as trails, which explains why the park is a multiuse destination for hikers, horseback riders, and mountain bikers. A 17-mile mountain-bike loop is a rare state park opportunity, but some single-track trails are designated for hiking only, including a scenic 2.5-mile loop past gushing High Shoals Falls. Why go: The park has one of the state’s best wheelchair-accessible nature trails. The .6-mile Hemlock Nature Trail’s streamside exhibits are packed with eco-insights, including a low-relief plaque of animal tracks and big, impressive dioramas (one about the trout stream ecosystem). Key things to see: Don’t miss High Shoals Falls and views from the Jacob Fork River Gorge Overlook and atop Chestnut Knob (2,199 feet). Best time to go: Summer is hot on these summits surrounded by Piedmont, so go in winter for clear leafless vistas. Stone Mountain’s granite dome rises 600 feet above surrounding forests. Similar domes dot the park, all part of a 25-square-mile pluton, a huge blob of igneous rock formed underground. Erosion has exposed the domes and cracked and creased the faces, the best example being the Great Arch, a large crack down Stone Mountain’s main face that’s a favorite in this world-class climbing destination. Hikers find great views from the peaks and dramatic cascades along plentiful streams. The biggest, Stone Mountain Falls, is a 200-foot drop. Why go: It’s a National Natural Landmark and a singular state park site. Best time to go: All year; the park is below the Blue Ridge and warmer than most area state parks. Protection of the 5,538-foot namesake summit at Elk Knob State Park is part of a growing effort to preserve a major range north of Boone, the Amphibolite Mountains. A gradually graded trail leads to the peak, where low vegetation permits a 360-degree view of northwestern North Carolina. Easy trails, one of them an interpretive TRACK Trail (a network of kid-friendly footpaths), circle the park’s primary facility, a picnic area. A Backcountry Trail leads to backpack campsites. Perched on the reliably snowy state line, Elk Knob is the only state park that plows its facilities and plans new trails specifically with snowshoers, cross country skiers, and winter hikers in mind. Why go: The park is just minutes from Boone, with a gradually graded trail to expansive high-elevation vistas. Key things to see: The Elk Knob Summit Trail’s interpretive plaques showcase Virginia’s Mount Rogers to the north and the entire High Country to the south, including ski resorts, Mount Mitchell, and Grandfather Mountain. This park pairs the formerly private Chimney Rock attraction with acres of cliffs and crags in Hickory Nut Gorge, a combo that’s one of the state’s biggest conservation achievements. The scenery is truly cinematic, as evidenced by memorable movies shot on location, including The Last of the Mohicans and Dirty Dancing. Since its acquisition as a state park, and while still being managed by a private concession, the 1880s Chimney Rock Park has undergone repairs and upgrades. Now, state-of-the art walkways lead to awesome vistas of Lake Lure far below. Why go: If you’re a rock climber or dream of becoming one, the park has instruction and guided climbs at the main attraction and great bouldering from the Rumbling Bald Climbing Access. Key things to see: Hike the easy three-quarter-mile to 404-foot Hickory Nut Falls. In the town of Chimney Rock proper, located at the park’s entrance, stroll the river walk from the Old Rock Cafe and Medina’s Bistro (both recommended and accessible to public parking). Don’t miss Bubba O’Leary’s General Store & Outfitters. Best time to go: Spring’s nice for gushing waterfalls. You can drive here—to launch a canoe or kayak, camp, picnic, or hike miles of trails beside the water or high above it. But much of this park is only or best appreciated from the watery solitude and splendor of a 26.5-mile stretch of the river, one of only two in the nation designated both a National Wild and Scenic River and an American Heritage River. Even beginning paddlers can cruise into adventure on a multi-day canoe trip, with overnights at private and state park campgrounds (complete with showers). Tubing is another great way to go, and local outfitters offer all manner of watercraft for rent and shuttles to and from put-ins and take-outs. Best time to go: During sunny stretches after rain in late spring and early summer, when the water level is higher, and especially during the June 4 New River Canoe Race that benefits the Friends of High Country State Parks. Grandfather Mountain’s near vertical-mile drop to the Piedmont makes for dramatic vistas and explains why 16 separate ecological zones shelter 72 rare plants. The famous Mile-High Swinging Bridge and related facilities still charge an entrance fee and draw hikers seeking easier access to the state park that wraps the highest summits in public ownership. Some of the South’s most spectacular and strenuous hiking trails climb ladders across the mountain’s rocky and rugged crest. Why go: With elevations reaching nearly 6,000 feet, Grandfather offers some of the highest hiking in the South. Best time to go: Fall color comes in early October, with crystal, distant views in late November. Our westernmost state park, Gorges is the gushing heart of "The Land of Waterfalls.” This 8,000-acre preserve is the only temperate rainforest in the state park system. The peaks wring moisture from the clouds and usher it over some of the state’s most spectacular cataracts. Trails are everywhere, for backpacking, hiking, mountain biking, and horseback riding. So are rarely seen species like Swainson’s warbler, the green salamander, Oconee bells and timber rattlers. Why go: A newish park with an impressive new visitors center, Gorges had the greatest percentage increase in visitors of any park in the state system in 2015. Between hiking, mountain biking, fishing, water skiing, canoeing and kayaking (the park rents both), swimming, and camping, Lake James offers a smorgasbord of recreation. This is the largest waterfront park in the system, with a lake providing unsurpassed scenery. The rugged summits of the Linville Gorge tower overhead, presenting a spectacular backdrop for paddling, paddle-boarding, or excellent fishing for cold-water species like walleye, muskellunge, and many others. The late-1970s idea of a statewide trail has finally jelled into a walkable route from Clingmans Dome in the Smokies to Jockey’s Ridge on the Outer Banks. The mountain section is in fact the most complete, and has drawn such notable hikers as President Barack and First Lady Michelle Obama. Why go: The trail samples the state from almost-alpine summits to an archipelago of islands, with a wealth of emerging trail towns along the way. Key things to see: The MST connects through seven state parks; pick one and find your favorite sight. Best time to go: Truly year-round. Cool off on Clingmans Dome or Mount Mitchell in summer, and in winter, hike to Jockey’s Ridge, the East’s highest sand dune. Detailed information on all North Carolina State Parks is available at www.ncparks.gov. Throughout 2016, the North Carolina Division of Parks & Recreation is hosting centennial events for the State Parks system. For details on them all, including an August 27 & 28 celebration at Mount Mitchell, visit www.ncparks.gov. The statewide Friends of State Parks raises funds for programs and initiatives, organizes volunteer work, and engages government to advocate for parks. For more on the organization, as well as a directory of local friends groups that promote and protect particular parks, visit www.ncfsp.org.